Colorful houses built amphitheatrically climb up the mountainside. A stroll through the birthplace of the aromatic aniseed drink. 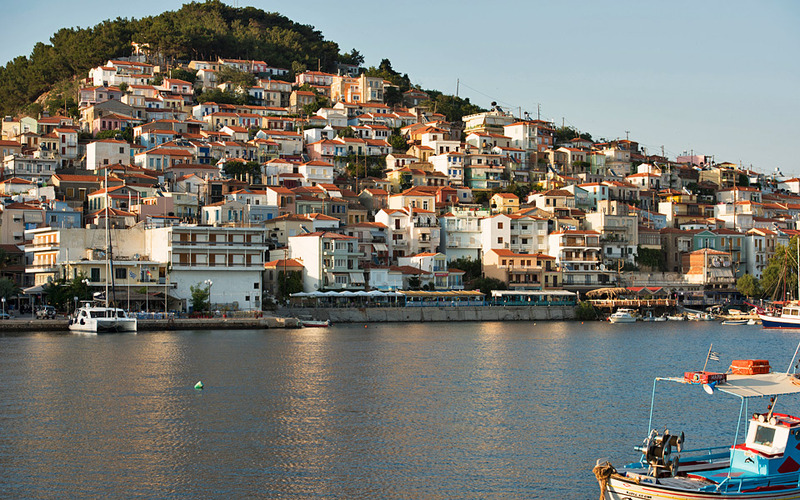 Lesvos’ rich soil, along with the distilling tradition that came from the Greeks of Asia Minor, made this North Aegean island the home of ouzo. There are 17 distilleries in Mytilene, a different name for Lesvos. Most of them are family-run businesses. However, Plomari, a small seaside town situated at the south of the island, is the real source of ouzo. The drink runs in the veins of Plomari’s residents and it accompanies them throughout their lives whether they’re celebrating or grieving. In the old traditional cafés, which remain unchanged for a century now, ouzo is part of playing backgammon, cards and teasing each other. Plomari is a wealthy, cosmopolitan area. It used to be a significant port during the 19th and 20th centuries due to its advantageous geographical position between Europe and Asia. It was famous for its naval and shipbuilding traditions and of course, for its factories. Just before the Minor Asia catastrophe, there used to be tens of soap-making businesses here, olive oil distilleries and factories for processing olive pits – olive trees grow in abundance on this island. Today, the factories’ smokestacks stand proud but abandoned. If you walk down Plomari’s narrow streets, you get a better feel of this town. First of all, the houses here neither remind you of the Aegean nor do they bear any resemblance to the architecture of the rest of the island; they are truly unique. Wandering around you see old neoclassical mansions, elegant and austere buildings with sachnisia (traditional enclosed balconies overseeing the house’s entrance). Walls in bold colors, old wooden doors and flowers planted in olive oil cans paint a beautiful picture. It seems as if time stands still here. This charming and timeless stillness is deeply integrated into the village’s beauty. The dry torrent of the Sedountas river amplifies the stillness. It might be dry now in the summer, but in the winter the water rises so much, the residents board up their front doors to prevent their homes from flooding. There are so many reasons to make you feel jealous of life here. Drinking ouzo, as with any other of life’s pleasures, has its own ritual. But the one thing to be mostly jealous of is this magical, relaxed atmosphere in the air. People here leave their kids’ toys outside, their bicycles unlocked and their canaries by the front door. I get the feeling that they enjoy life a little bit more than the rest of us. 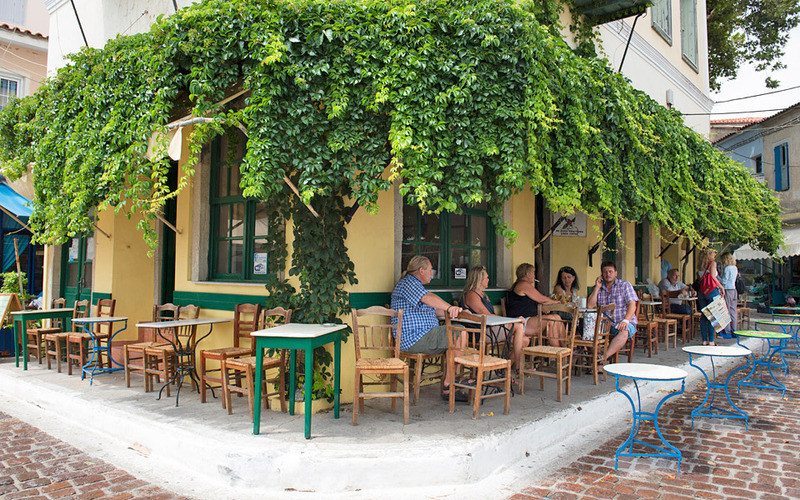 And in the evening, they all meet up at the square, underneath the plane tree that’s been there for centuries, sipping ouzo and enjoying local, exquisite meze. Drinking ouzo, as with any other of life’s pleasures, has its own ritual. Ouzo is drunk in company, before dining, along with small meze plates. The mezes are of different tastes: sweet, salty, spicy and sour. Sardines, local cheese ripened in olive oil, octopus, green beans, anchovies, zucchini flowers, tomatoes and olives combine together in the mouth, increasing your appetite. The longer it takes to feel full, the better for the company. The prominent cookbook author, Christos Zouraris, mentions in his book Deipnosofistis,that the purpose of drinking ouzo is to create a happy and teasing atmosphere. There is only one rule: you first pour the ouzo in the glass, then you add the water and in the end, you add the ice. This way, ouzo cools down slowly, allowing the release of all the flavors. One of the biggest distilleries on the island is Ouzo of Plomari Isidoros Arvanitis. They export ouzo to more than 35 countries. 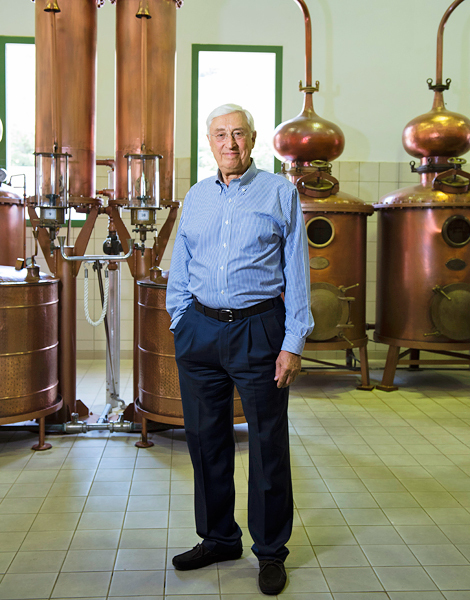 Its owner, Nikos Kalogiannis, has been working at the distillery with his father and grandfather since he was a child. 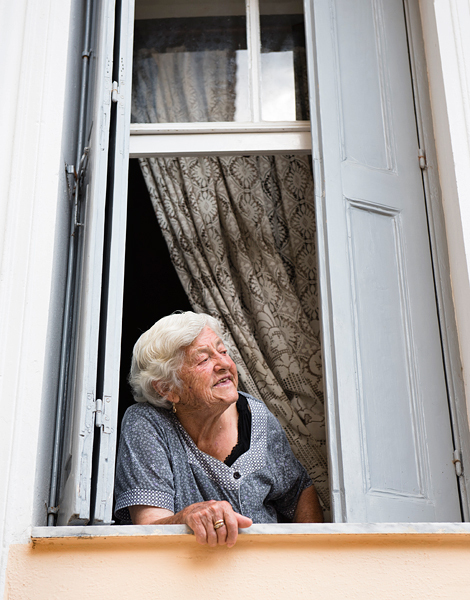 Every night, returning home on the bus, one could smell his ouzo-fragranced clothes from miles away. On a recent tour of the distillery, Nikos recalls a few local women gossiping, saying: “Does this child have no mother? Does she let him drink?”. Ouzo has been in his veins and on his clothes since he was a little kid. Ouzo is drunk in company, before dining, along with small meze plates. The company founder, Isidoros Arvanitis, was also the one who put the recipe together back in 1894. The ingredients were: water from Sedountas River, salt from Kalloni’s famous salt quarry and more than 15 herbs and spices, such as aniseed, fennel, cinnamon and nutmeg from the land of Lesvos. Today, the Kalogiannis family continues the business respecting the tradition. The distilling process takes place following the old method in copper, hand-made cauldrons. As the demand grew, the pot stills increased in numbers. 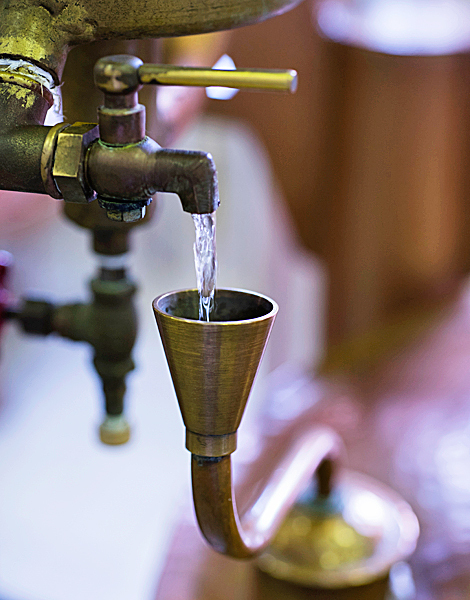 These days there are 18 of them; each one works autonomously, so we could say that there are 18 separate ouzo making factories within the same distillery, all of them distilling at 100 percent. This place resembles a living museum. During your visit, you can have a look at an impressive collection of museum items: from old bottle labels to pot stills and some of the very first manual equipment. 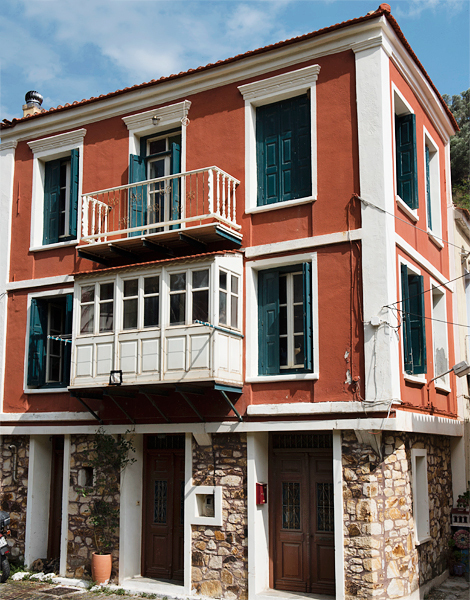 In Plomari you see many sachnisia: traditional enclosed balconies overseeing the house’s entrance. There are of course street cameras! What makes the difference in the quality and taste of ouzo is the aniseed. The Kalogiannis family owns private estates in the village of Lisvori where organic aniseed grows. They say that the best aniseed in the whole world grows in Lisvori. Its oils and aromas are unique. Currently, efforts are being made to protect the designation of its origin (PDO). Kostas, who takes care of these fields, says to us “Aniseed doesn’t grow anywhere else, just in this place”. We visited one of these fields by the sea and without being specialists we immediately understood what he meant. It took just a small bite on a tiny seed and our mouth was full of freshness, sweetness and aroma; exactly like drinking ouzo. This crystal-clear, full-of-flavor drink, that burns your throat, would be nothing without good quality aniseed. Wherever you go to drink ouzo, it won’t feel the same as it feels when you are in this place, by the sea, next to those who know how to make it properly, enjoying it in what the locals respect the most: those traditional cafés that stand still in time.